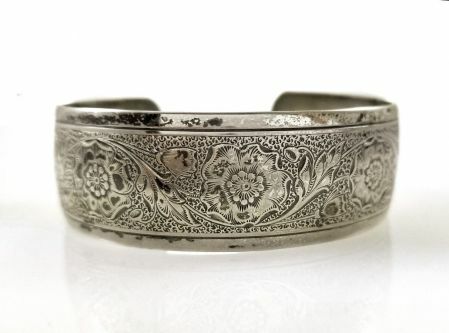 Description: Here is a beautifully engraved floral sterling silver cuff by American silversmith Danecraft. This flower and foliate pattern is embossed across a slightly domed 3/4" wide bracelet with crisp detailing. The opening is slightly flexible and will fit a 7" wrist. Marked Danecraft sterling. Measurements: The inside diameter measures 2 1/4" at the widest and fits on a average sized wrist.